More than 15 years ago, family and I had a travel to the Shinshyu highland. We passed by the Karuizawa area, which was known as the first class highland resort. When we had a walk around wood, we found a small church. In front of the church, there was a red carriage. I noticed that this was the famous church for marriage in Karuizawa, where was a famous nice resort. Those couples, who needed not gorgeous marriage ceremony, sometimes made use of this church. After the plain marriage ceremony, the couple took the carriage, which was the symbol of this church. As the ordinary expense for marriage and banquet, it took about 1.5 or 2.0 million yen in Tokyo. However the cost of this church was so cheap, that is, less than 200,000 yen. Therefore this church was quite well-known at that time. I thought this was a good strategy. "This is one of the most famous churches of Karuizawa. Since the beginning of 1900's, many novelists or poets gathered here and told about freedom and culture. Since then this church has been opened. We offer the chance of marriage ceremony to couples. Since 1974, we have accepted non Christians. This church is opened to such people, who had once a wedding ceremony here, visitors or neighbors." Well, this was exactly expressed their image. When we visited here about 15 years ago, we were attracted by the romantic mood and I took a family photograph in front of the carriage. This photograph is nowadays one of the most important one for my family. Since then about 15 years have passed. My wife and I have aged and my daughter is going into 30 years-old. Three of us happened to pass Karuizawa again. We reminded of the past photograph of the church again. We tried to find the church again. The map showed the location of the church. We went there. However we could not find the way to the church. We finally went into a big hotel. Then we asked a parking man the way to this church. He simply said, "Oh! The church is located in the garden of this hotel." We doubtfully went the direction that he pointed out. There was a triangle shaped church. I thought this was a wrong building. We walked around this church building and suddenly found the old church. I soon found that this was the one that we tried to find. Although there was no more carriage, the shape of the building and entrance was exactly I remembered. We had impressively watched the building for a while. Then a woman came out from the building. I asked her whether there was a carriage in front of the building. She said there was before and they used to put the just-marriage couple in it, but they had already stopped the carriage service. I referred to the website of this Karuizawa Highland Church. "In September, I found the face of my acquaintance among the gathering people to my church. I asked him whether he was Mr. T or not. He said I was so happy you remembered me. I came here with my family. His family was his wife and two daughters. They got marriage here in 1984. At that time they were so young and poor. They tried to find a suitable church for their marriage ceremony and finally came to my church. Mr., T reminded of their wedding ceremony. It was the season of red leaves. They were so happy to get married under such a beautiful circumstances and romantic place. As they were only two of them, the clergyman asked passengers to give them the rice shower, on which they were so memorial. 20 years have passed since then. However this church still exists. Since their marriage they have visited this church every year. This is the backbone of their heart. 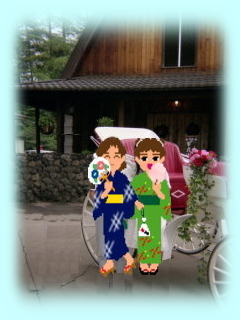 As their daughters have grown up to be high school girls, sooner or later they will get married with someone. If they would get married at this church, they would be happy. " What a good story it is! This is such a plain church in nature. However when we visited here again, we felt some thing had different from such image on this church. It was because of the big hotel surrounded this church. When we went into this Hotel Bleston Court, there were many customers who were related to marriage ceremonies and banquets. This hotel seemed to be eager to the marriage business. There was a Hollywood movie, named as "Back to the Future". This is a Science Fiction movie that the hero goes to the past or future. It showed us the three kinds of the clock tower of the past, present and the future. I was surprised to see the three kinds of clock tower places in the movies. The shock when I saw this Karuizawa Highland Church again after 15 years was the same as this movie. Only 15 years ago, it was a plain church in the wood. However it has totally changed to be the front runner of the bridal business. No wonder why my family and I were so shocked to see. 1914__ The Hoshino Hot spring Inn started their business. 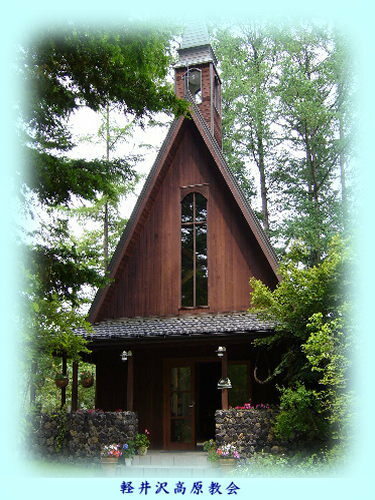 1965__ They renewed the Karuizawa Highland Church and went into the bridal business. 1995__ They opened the Hotel Bleston Court. 2001__ They owned and started to operate the Resonarle Obuchizawa. 2003__ They owned and started to operate the Altz Bandai Resort. 2004__ They owned and started to operate the Alpha Tomanu Resort. 2005__ They will open the Hoshinoya Karuizawa and maximize the hot spring business. As they wrote that in 1965 they renewed the Karuizawa Highland Church and went into the bridal business, from the beginning, they seemed to chase their bridal business through this church. Since 1995, when they opened the Hotel Bleston Court, they seemed to be successful in the bridal business and now they started a new business of the re-vitalization of the hairspring inns. If I will be still alive, I would like to visit this church again after 15 years from now. Maybe I could see another "Back to the Future".